This article explains how to enable and configure Locations for Online Bookings. Make sure Staff members and Services/Classes are enabled for Online Bookings before proceeding to this step. 2. 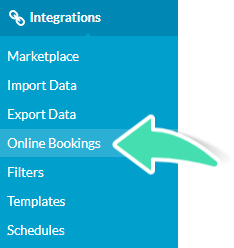 Click Online Bookings under Integrations. 3. Click on the Location to enable and configure. 2. Choose to accept new client registrations online or not by selecting Blocked or Allowed next to Registration. 3. Allow Clients to join the waiting list or not by selecting Blocked or Allowed next to Waiting List. 4. 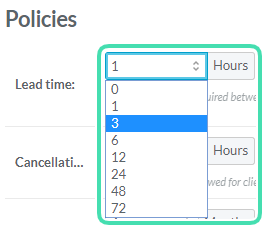 Select how many available times to display per period of the day (morning, afternoon, evening) from the dropdown menu next to Availability. This applies to Services and Classes. Available Times are displayed according to the duration of the Service and the Diary Time Slot set up in the Location. 5. Select the Consent field for Communication and Marketing that will be displayed (SMS, Emails, both or none). 6. Select the type of Confirmation Clients will receive for their booking from the dropdown (Email or Email and SMS). 7. Select the Notifications received in the diary following a booking or a cancellation. It is recommended to tick both options. 8. Select if a Client Form will be sent to the Client after the booking next to Intake. 1. 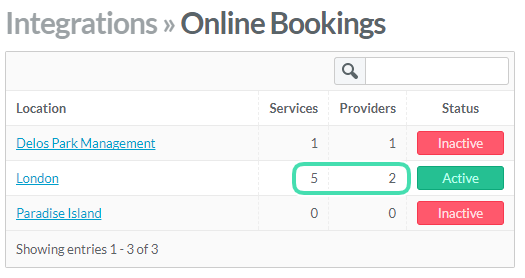 In the table under Available Types, tick the Services/Classes under Providers’ name to make them available for Online Bookings. If a Staff member, a Service or a Class isn’t displayed in the table, go back to the specific Staff/Service/Class page and enable the integrations option. 1. Select the minimum Lead time for Clients to book appointments from the drop-down menu. 2. Select the minimum time allowed for Clients to cancel appointments booked online from the drop-down menu next to Cancellation. 3. Select the maximum time range offered to Clients to book online from the drop-down menu next to Maximum. 4. Add Term and Conditions such as cancellation policies. Clients need to acknowledge these prior to confirming their booking. Either type a text in the text box or add a link to your website where such terms and conditions are already accessible. 2. Verify that the quantities of Services (including Classes) and Providers are accurate. 3. Repeat these steps for each Location. Once this step in done, Generate a Link for the Online Booking platform to share to Clients.